We have revealed the top publishers for the Google SERPs and Google News in 2018 for six countries: Australia, France, Germany, Switzerland, the UK and the U.S. While news publishers are definitely focused on the geographical areas they cover, there are some important lessons to learn from all of our analyses. So, here’s a round-up of our findings for 2018. Like the country analyses, we took our general keyword set – consisting of Google News and Google Trends topics – as a base to cover the most important news in each different country. 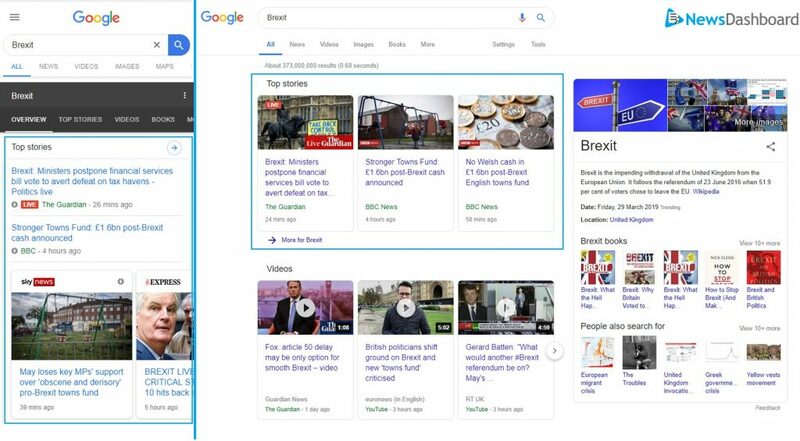 The Google News front page in the U.S.
An example of the desktop and mobile News Boxes for the keyword “brexit” on the UK search engine result pages, or SERPs. Overall, the Google News redesign in May 2018 affected all countries in Google News and on the SERPs, but the individual results vary widely. Another defining result: There is mostly a single publisher that dominates visibility for general-interest topics in all Google (News) areas, and those top publishers are also general-interest publishers- spiegel.de in Germany, cnn.com in the U.S., blick.ch in Switzerland and news.com.au in Australia. Just the UK (bbc.co.uk and theguardian.com) and France have more than one leading publisher. These publishers often also appear in news visibility results for different countries with the same language, such as cnn.com in Australia and the UK, and spiegel.de in Switzerland. Generally, we see more publishers from more densely populated countries in the visibility ranks for less densely populated countries with the same language, but it can also work the other way. In Australia’s Top 10, we even see publishers from two other countries: the UK and U.S. Most often we see niche publishers from different countries ranking for category specific topics. Especially in categories like Science, that rarely appear in the general top stories, many other publishers are able to score really well. The same publishers often appear on the most visible lists for both devices (mobile and desktop), but that does not generally mean that they hold the same ranking position for both. Since the appearance of video ranks, youtube.com seems to be the overall preferred publisher here – obviously because it is Google’s own video platform. For our 2018 analyses, we looked at the AMP ranking share of the Top 20 mobile News Box publishers of the respective countries. Again and again, Google has said that the preferred mobile format is Accelerated Mobile Pages for online publishers, making news websites more user-friendly with quicker loading times, but harder in upkeep and less ad-friendly for site owners. 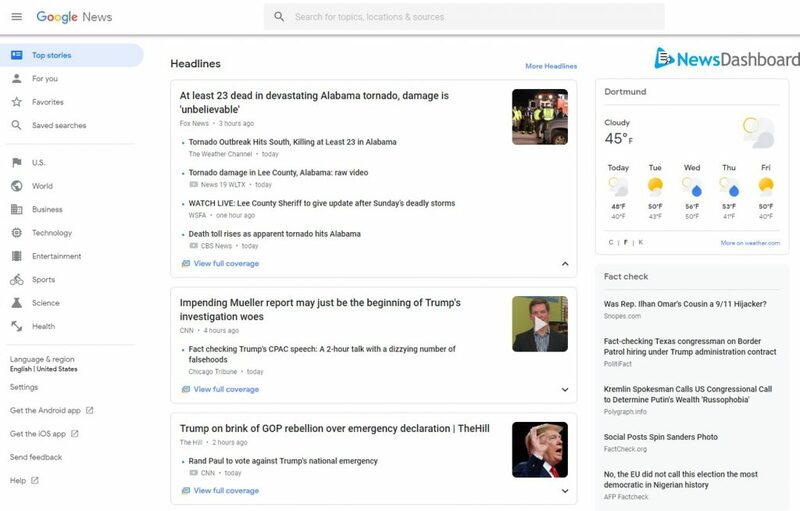 Using News Dashboard data, we’ve consistently found that implementing AMP on a news website can help increase visibility in the mobile news rankings. In the U.S., there was only one non-AMP publisher in the Top 20: espn.com. Often, the same general interest publishers do well, but not equally, in all ranking types. But, niche publishers are also able to score in their respective categories. Foreign publishers can do great in countries with the same official language. Google’s AMP preferences were generally proven by our analysis, with some countries having at least one non-AMP publisher in the most visible set. Overall, AMP is strongest in the UK. If you enjoyed our results and want to find out more, including starting a demo of the News Dashboard for your newsroom, e-mail us via service@newsdashboard.com. Acknowledgements: The basis of this analysis is the general keyword set. We collect our news-related keywords from Google News (news.google.com) as well as Google Trends, and keywords are from Jan. 1-Dec. 31, 2018. Rankings on the SERPs are checked every 15 minutes, and on Google News every 30 minutes.